A beach full of diamonds. Ok, well not quite. 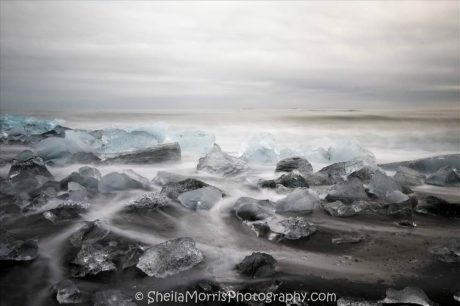 But there is a place in Iceland that is commonly known as Diamond Beach, where the ice that has fallen from a nearby Jökulsárlón glacier lagoon end up on the beach. There are hundreds of icebergs of varying sizes on this beach. Even chunks small enough to put in a glass of whisky, which I saw one group of tourists do. One thing I would say about this location, be very wary of climbing on the larger icebergs, you never know when a rouge wave is about to strike and you could end of soaked to the skin from the icy North Atlantic.